The vast Tibetan Plateau, the "roof of the world", spans a large area which goes beyond the political boundaries of the Chinese autonomous region of Tibet (Xizang), since it also includes much of the neighbouring Qinghai Province, which lies to the east. This area has a fairly uniform climate: freezing and windy but dry in winter and mild or cool in summer, with considerable variations between night and day due to the strong sun's rays that are typical of high altitudes. The north is a bit colder than the south, but the temperature varies mainly with altitude; the only significant difference between the areas is that the eastern part is affected by the summer monsoon, so it receives a bit of rainfall (sometimes even abundant) in summer. Lhasa, the capital, is located in the eastern part of the province as well, while the central and western parts of Tibet are virtually uninhabited, since they are desert. 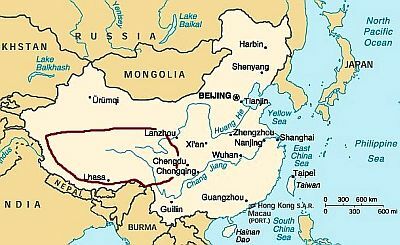 While in winter the coldest areas of China are the northermost ones, in the other seasons the coldest region is Tibet because of the high altitude. 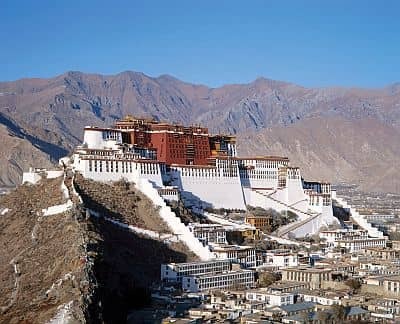 Lhasa is located at 3,500 meters (11,500 feet) above sea level: at this altitude the air contains 68% of the oxygen that is found at sea level. In addition, at high altitudes water boils at lower temperatures: it boils at 90 °C at 3,000 meters (195 °F at 9,800 feet), at 87 °C at 4,000 meters (189 °F at 13,100 feet), and at 84 °C at 5,000 meters (183 °F at 16,400 feet). In Lhasa, winter nights are freezing cold, and on colder nights the temperature can reach -15 °C (5 °F), but during the day it almost always exceeds freezing (0 °C or 32 °F). It should be remembered that we are at a low latitude (29 ° north), so the sun is quite strong even in winter, and also that winter here is the sunniest season. The cold is usually bearable, even because the air is dry, except when the wind blows: as already mentioned, Tibet can experience strong winds especially in winter. Despite the fact that the winter is dry, sometimes light snowfalls may occur. Summer in Lhasa is mild, quite cold at night, about 9/10 °C (48/50 °F), and pleasantly warm during the day: the average is 23 °C (73 °F) in June, but the almost tropical sun, especially at an altitude so high, in summer is very strong, so in the sun it feels warmer. In the hottest days, the temperature can reach 27/30 °C (81/86 °F) from May to August. Here are the average temperatures of Lhasa. The summer monsoon brings rainfall from June to September; July and August are the rainiest month, with 120/125 mm (4.7/4.9 in) per month on average. Here is the average precipitation. In Lhasa, sunny days prevail for much of the year, while in summer the sun shines a bit less often because of the monsoon. In summer, Mount Everest is often covered with clouds as well, so in this season it is more difficult to spot. The vast areas of Tibet located at higher altitudes, and especially the ones located in the north, have a worse climate than the capital. Between 4,000 and 4,500 meters (13,000 and 14,800 ft), the temperature often remains below freezing all day long in winter, while at night it normally drops to -20 °C /-25 °C (-13 °F /-4 °F), but sometimes it can plunge below -40 °C (-40 °F), after outbreaks of cold air from the north. Summer at this altitude is cold at night, with lows around 3/5 °C (37/41 °F), and mild during the day, with highs around 15/17 °C (59/63 °F). Here are the average temperatures of Nagqu, located north of Lhasa, at 4,500 meters (14,800 ft) above sea level. Xining, located at 2,260 meters (7,400 feet) above sea level, is the most populous city of the Tibetan Plateau and the capital of the Qinghai Province. Here, the lower altitude is balanced by the higher latitude (the city is located at the north-eastern edge of the plateau), so much so that winter is colder than in Lhasa, while summer is a bit warmer: the average temperature ranges from -6.5 °C (20.5 °F) in January to 18 °C (64 °F) in July. Here, 360 mm (14 in) of rain fall per year, with a maximum of 80 mm (3.2 in) in August, and very little rain (or rather snow) from November to March. As already mentioned, the western part of Tibet, even more arid and located at very high altitudes, which often exceed 5,000 meters (16,400 ft), is almost totally uninhabited. The best time to visit Tibet is summer: in Lhasa and in the east you may prefer May and September to avoid the bulk of the summer rains, but at higher altitudes, and maybe in the western area which is dry, you may prefer the June-August period, to reduce the risk of cold nights, though above 4,000 meters (13,000 ft) it is inevitable. In spring and autumn, in Tibet the climate is variable, it can be very cold with possible snow and frost especially at night, while the days can be sunny and mild. Those who don't suffer from the cold can choose spring and autumn, to enjoy the clear skies, which among other things allow to see the high mountains in the distance. In winter: in Lhasa, bring warm clothes, fleece, a hat, gloves, a parka, being ready to take off the outer layer during the day. In the north and at the highest altitudes, bring clothes for the big cold, synthetic thermal long underwear, a parka, a Gore-Tex jacket, gloves, a hat, a scarf. In summer: in Lhasa, bring spring/autumn clothes, t-shirts for hot days, a sweater and a jacket for the evening, sunscreen, sunglasses, a raincoat or umbrella, a scarf for the wind, hiking shoes. For the north and the mountains, bring a long jacket for the wind, a down jacket, a hat, gloves, a scarf. A sleeping bag and a warm jacket for outdoor overnight stays.